Volvo IPS Interface Unit for SPX-CAN Autopilots. 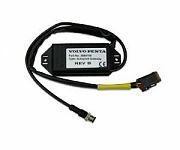 Converts NMEA2000 to Volvo input. Includes Volvo MultiLink cable to plug into vessel's wiring harness.